The electrified line between Blackpool and Manchester is slowly re-opening. Driver training is underway and limited rail services to Blackpool are being introduced as described below. Also Bolton station will be closed on certain weekends as below. On Monday 16th April diesel services will start between Blackpool North and Manchester Airport, these trains are hourly. 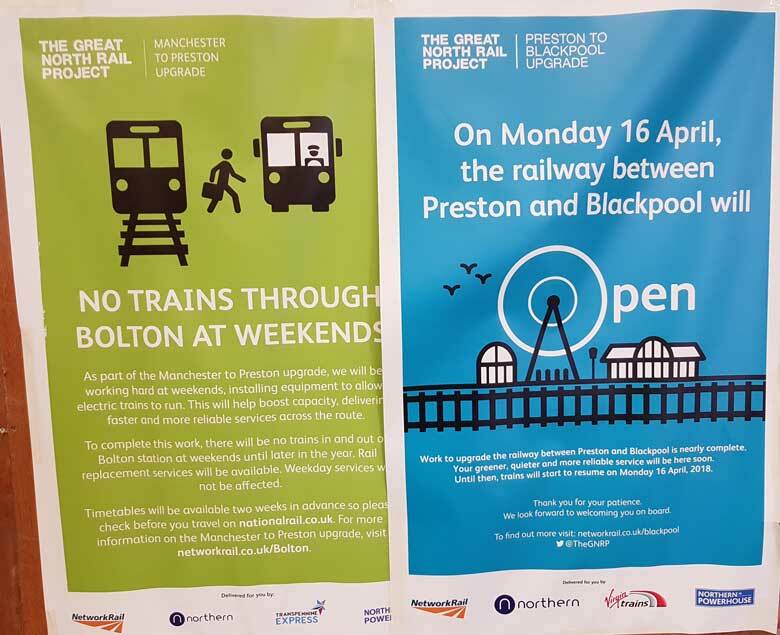 Other services will be operated using buses from Blackpool to Preston for the week 16th to 20th April. From Saturday 21st April a full service will be run although the line through Bolton is closed at weekend except on the 21/22 April and 19/20 May. On May 20th the summer timetable will begin and electric trains should operate from Blackpool North to Manchester, Liverpool and London. Services to Leeds via Blackburn will remain diesel operated. As is the service to Blackpool South. It’s recommended you check the time of your train if going to Blackpool or via Bolton as the timetable changes, often at short notice. This entry was posted in Rail. Bookmark the permalink.